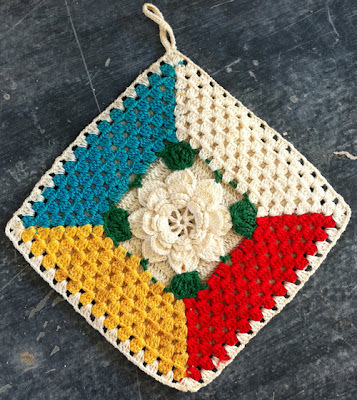 I found this beautiful crochet potholder at the Liberty Antique show. 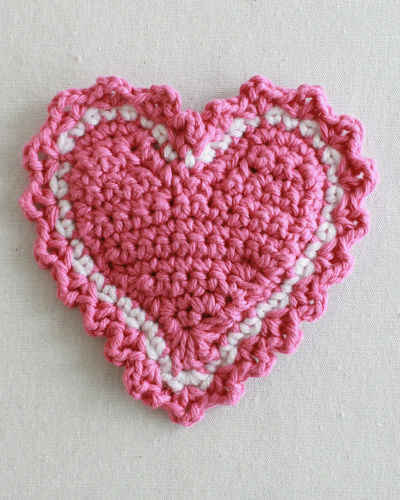 This Rose Granny Crochet Potholder is worked with size 10 crochet cotton thread. You could try it with larger yarns, especially sport weight cotton. If it gets too large you could decrease the number of rows. 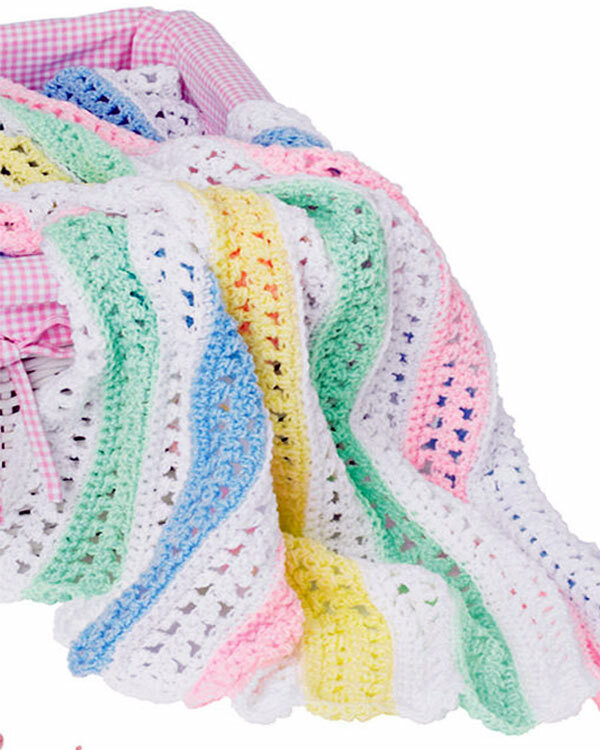 To make the crochet skill easier you could omit the color change in the granny rounds and just do one solid color of crochet thread. The possibilities are endless! Double Treble (dtr): Yarn over hook 3 times, work off 2 lps at a time. Cluster (cl): Keeping last loop of each specified st on hook, work in st or sp indicated, yo and pull through all loops on hook. Rnd 11: Ch 3, 2 dc in same st as joining, * (ch 2, skip 3 dc, 3 dc in next dc) across to corner sp, ch 2, (3 dc, ch 2, 3 dc) in corner sp; rep from * around omitting final 3 dc on last rep; join. (52 3-dc groups) Finish off and weave in ends. Rnd 4: Ch 1, working in ch-3 sps behind petals, (sc, ch 1, 3 dc, ch1, sc) in each sp around; join. (8 petals). Rnd 6: Ch 1, working in ch-4 sps behind petals, (sc, ch 1, dc, ch1, 5 tr, ch 1, dc, ch 1, sc) in each sp around; join. (8 petals). Rnd 8: Ch 1, working in ch-6 sps behind petals, (sc, ch 1, dc, ch1, tr, ch 1, 5 dtr, ch 1, tr, ch 1, dc, ch 1, sc) in each sp around; join. (8 petals). Finish off White and weave in ends. Rnd 9: With right side facing, join Green with sl st to center dtr of any Rnd 8 petal, ch 4, 2 dtr cl in same st as joining, (ch 1, 3 dtr cl in same st) twice, ch 10, sc in center dtr of next petal, ch 10, * 3 dtr cl in center dtr of next petal, (ch 1, 3 dtr cl in same st) twice, ch 10, sc in center dtr of next petal, ch 10; rep from * around; join. Finish off and weave in ends. At the end of Rnd 16, DO NOT FINISH OFF WHITE. Finish off other colors and weave in ends. Rnd 1: With right sides of Back and Front facing (wrong sides together), matching corners, with White, ch 3, working through both thicknesses, 2 dc in corner sp, (ch 2, 3 dc in next sp) across to next corner, 3 dc in corner sp, ch 20, join to first ch to form ring, 30 sc in ring, ch 1, 3 dc in same corner sp, * ch 2, 3 dc in next sp; rep from * around, working (3 dc, ch 2, 3 dc) in each corner sp, and ending with 3 dc in first sp, ch 2, join. Maggie, in the above pattern (which I love, by the way) I notice on the instructions for the FRONT, Round 10 is missing. It goes from Round 9, where you fasten off and weave in ends, straight to Round 11 where you join white thread. Is this just a mis-numbering in the rows, or was Row 10 inadvertently omitted? I have copied your post to our editor. I will get back to you on Monday with a correction. Sorry for the inconvience. Wow, that is just marvelous! 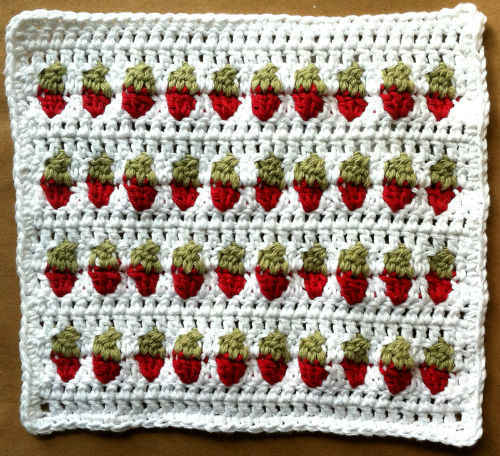 I adore this potholder…I'd NEVER use it, just admire it! Thanks for the pattern, it's just lovely! Rnd 11 – should read Rnd 10. Rnds 12-16 – should read Rnds 11-15.